Home > History of UFOs > Were Aliens The "Ancient Astronauts" Of Literature? The modern concept of the "flying saucer" and the associated notion that we are being visited by extra-terrestrial beings really only entered the public consciousness in the post-World War II era. If aliens are visiting us however, it is appropriate to ask when their visits started. Was it only after we harnessed the secrets of the atom and acquired the ability to destroy ourselves and perhaps others? Or could there be a long hidden history of alien contact which is obscured in the documentary record because people living in those earlier times lacked the conceptual framework with which to describe it? A number of researchers have re-examined the traces left by earlier cultures in light of our modern understanding of the UFO phenomenon and believe they detect signs that we have a long record of alien visitation in flying saucers. Some believe that certain artefacts or structures around the world are designed either to embody knowledge gleaned from these alien spacemen or to send a message to them. The Nazca lines in Peru, for example, are one of the most perplexing traces ever left by a primitive culture. They are huge images (the largest being around 900 feet), carved into the hard desert sand, depicting a variety of things, but mostly common creatures such as birds and animals. 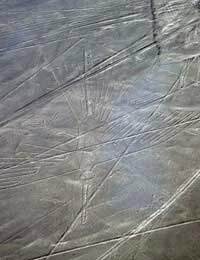 What makes the Nazca images especially intriguing is that they cannot be seen from the ground and there is no evidence that the Incan people who created them possessed any flying technology. Could they have been designed to be seen by flying saucers? Some have noted that a few of the images do not resemble any known earth creature. One of them depicts a bulbous-headed humanoid with large eyes - similar to our modern notion of a "Grey" extra-terrestrial. Another shows a humanoid with four fingers. Although the Nazca lines may be the grandest in scale, they are not the only art left by primitive people which depict what may be aliens. In cave paintings and early engravings found all around the world, there are examples of curious figures which strongly resemble contemporary descriptions of alien beings who might have visited in UFOs. Many primitive religions speak of Gods as beings who live in the sky, and occasionally come down to Earth to commune with humans. "I looked, and behold, a stormy wind came out of the north, a great cloud, with flashing lightning, and a brightness around it, and out of its midst as it were glowing metal, out of the midst of the fire. Out of its midst came the likeness of four living creatures. This was their appearance: they had the likeness of a man. Everyone had four faces, and each one of them had four wings. Their feet were straight feet; and the sole of their feet was like the sole of a calf's foot; and they sparkled like burnished brass. The living creatures ran and returned as the appearance of a flash of lightning." This sounds very much like a modern UFO encounter report. There are several passages in the Bible and in other early literature which could be subject to similar interpretations. Erich von Daniken is one of the most influential of the "Ancient Astronauts" theorists. His book, Chariots of the Gods, was enormously successful worldwide and helped propel the Ancient Astronauts idea into the mainstream of popular discourse. Others have followed in his wake, including Graham Hancock and Zecharia Sitchin. A number of these writers believe that, not only did extra-terrestrials visit us in earlier periods, but that these aliens may well have helped spawn our earliest civilisations or even performed genetic manipulations which helped humanity rise from the level of the beasts. At the extreme, this interpretation sees the entire development of the human race as some kind of UFO alien project - but to what end? Some believe their motives were benign: that they simply had a wish to foster the development of sentient life. Others take a contrary view and believe the aliens may have intended humans to be their slaves, or even their food stock! If this is true, our entire civilisation may have developed in what is no more than the "fattening-up" period before the flying saucers return for their snack! We can only hope this is not true.